There is a need for understanding between Israelis and Palestinians, according to the Bishop of Down and Connor. Bishop Noel Treanor was one of the 15-strong delegation of the Holy Land Coordination, which has completed its pilgrimage to Israel and Palestine. For the past 20 years the Coordination has brought bishops from Europe, North America and South Africa to the Holy Land. This year the group included two Irish bishops: Bishop Treanor and Bishop Alan McGuckian of Raphoe. Speaking to CNS, Bishop Treanor said the visit helped the delegation to see that a permanent and sustainable solution was needed for the good of all. Bishop Treanor, who worked for many years in Brussels with COMECE, said that every generation had the “responsibility to take the necessary steps to promote mutual respect and understanding”. Stressing the important role to be played by the international community, as had occurred in Northern Ireland, he said the kinds of problems faced in the Holy Land were part of the human condition. 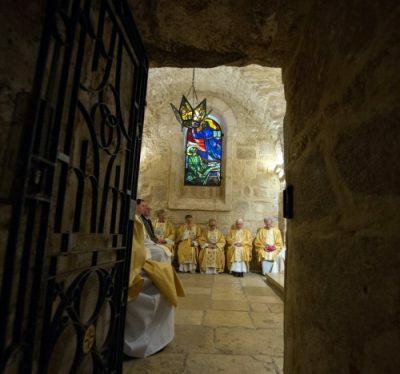 This year’s Holy Land Coordination focused in particular on the plight of Christians living within the state of Israel. Most of them are Israeli citizens, but the vast majority (80 per cent) are also Arab, making them part of a double minority. These Christians can find it hard even to attend Mass on Sunday, which is the first day of the Israeli working week. In their final statement the bishops, who were led by Bishop Declan Lang of England and Wales, said that Israel’s Christians wished to live as full citizens, “with their rights recognised in a plural and democratic society”. “We have seen the vital contribution that they make, especially through schools, hospitals, involvement in public life and attempting to build bridges between different faiths,” the bishops said in their statement. “Yet it is clear that at the same time they face profound difficulties across all aspects of their lives. We have heard that, along with other Palestinian Arab citizens and migrants living in Israel, many Christians find themselves systematically discriminated against and marginalised. The Nation State Law recognizes Israel as “the national home of the Jewish people”. The bishops’ final statement also underlined the harmful effects that US cuts in government funding are having in Palestine. “Our delegation also travelled to Palestine, where despite the faith and resilience of those we met, the misery of occupation has been deepened by severe cuts to humanitarian funding by the US government,” they wrote. The bishops called upon their own governments to “help meet the funding gaps now faced by the United Nations Relief and Works Agency (UNRWA) and redouble their efforts towards a diplomatic solution, with two democratic sovereign states of Israel and Palestine existing in peace”.